Professor Robert Meyer’s Advice to Young Bassists: Don’t be Another Domino King! Part One. A Domino King, in British slang is someone who persists in making false entries; this blog is an attempt to help all tyro bassists and maybe others to avoid coming in at the wrong place. Maybe, after annoying your wife, family, girl/boy friend and your neighbours by your constant practicing you have landed, after audition, a place in a great orchestra. Now that you can play all the Bottesini pieces in fingered octaves you may think that you have at last arrived. Not so. You have your first foot on the ladder but you now have to learn the craft of playing in an orchestra. I got my first job over sixty tears ago in the London Philharmonic Orchestra after giving an audition. Sir Thomas Beecham was the conductor at that time. Even though the audition was successful I still had to play next to Victor Watson, the principal bass at a rehearsal, to see what I was like in the orchestra. That was not all, I was hired on probation for three months and only after that was I given a contract. I don’t know what the hiring procedures are for the entire world’s orchestras but most are stringent, therefore I thought I would write an article giving you tips you can follow in order that you not be dubbed a “Domino Queen/King” and thereby lose the job you have worked so hard to get. Social mores may have changed since those days but human nature hasn’t, so believe me, as the new kid on the block you will be under silent scrutiny in your every move, and things have a habit of going back. I had the misfortune of having to sit next to an old timer, Fred, who surely didn’t like the idea of “all these young chaps coming into the orchestra. Where was their experience?” He would never mark the part and castigated me if I did, looking down his nose and saying “After all my years in the business I don’t need to mark the parts, neither do you. You can only learn by experience”. Fred was hoisted by his own petard when, in rehearsal of Tchaikovsky’s “Pathètique” Symphony, last movement, where there is a loud chord preceded by a strong upbeat he came in too soon. Even Koussevitsky who was conducting roared with laughter. In the next installment of this blog I’ll give you a few tips so you can avoid being like Fred. I was very fortunate to meet Koussevitsky and play with Victor Watson when I was in the London Philharmonic Orchestra sixty years ago. They had played the Bottesini Duos together long before when Koussevitsky was performing as a bass soloist. I learned a lot from Victor about these Duos and vowed that one day I would record them as faithfully as I could to the directions Victor gave me. Well, I have just recorded the Polacca and some other bass pieces using the Orchestral tuning GDAE, and I have incorporated all of Victor Watson’s and Koussevitsky’s suggestions on its rendering, also Victor de Sabata’s observations on the performance of the “Otello” solo. This can be heard in my CD, Discovering the Double Bass. You can always count on Ravel to put a few harmonics in the bass part; one piece I can think of is his “Mother Goose” Suite. At one time there were heated debates over suggested changes to some of the harmonics but now there is a general concensus of opinion that the printed part is correct. I was fortunate enough to play a concert performance of “L’Enfant et les Sortilèges” in the late 1940’s with the London Philharmonic Orchestra conducted by Victor de Sabata the brilliant principal conductor and Director of la Scala Milan who had conducted the first performance. He got a wonderful performance and at rehearsal even corrected the pronunciation of a French choir that was brought over specially. There is a big bass solo consisting of all harmonics combined with two flutes that starts near the beginning of the opera at Fig. 1 which goes on for 21 bars or so. It is very exposed. There are other difficult bits around Fig. 95 Adagio and 96. Victor Watson played the solo bass part which he found very difficult both technically and rhythmically. Some years later I played the solo part. I got through it O.K. but I was glad when it was over! It was WWII that put classical music on the map in England. During the war an organization was formed, The Council For Encouragement of Music and the Arts, (C.E.M.A. ), which sponsored concerts for the entertainment of the Troops and munitions workers. Later on it was taken over by a department of the British Council. The London Philharmonic Orchestra and the London Symphony Orchestra were funded together with many smaller classical ensembles. The concerts were well attended and so began the big post war classical music revival which lasted for over twenty years. Then the economy changed, and also peoples tastes, plus there was a huge development in recording technique and television. Walter Legge founded the. Philharmonia Orchestra in the mid ‘forties and a little later Sir Thomas Beecham founded the Royal Philharmonic Orchestra. This meant five Symphony orchestras in London (if the BBC symphony Orchestra is included) fighting for a part of an ever diminishing pie. Perhaps there was a surfeit of classical music or maybe the rise of rock bands contributed to the diminishing audience also the shortage of discretionary cash plus the proliferation of ipods has affected matters. For the past few years much of the recording that was done in London has now given way to recording in some of the Eastern European countries where the fees are much less and as I mentioned in Blog #1 of this series technology has developed so rapidly that virtual orchestras replace live musicians in the pit. Despite the doom and gloom that prevails I notice that many concerts still attract full audiences, the reason being, I think, is that these are superbly played and designed to give the classical music lovers not just a concert but a great experience. The old days of giving a Tchaikovsky Symphony, the Grieg piano concerto and the 1812 overture with military band and fireworks may be going out of the window. The last surviving radio orchestra in North America, the CBC Vancouver Radio Orchestra was recently axed. I read some comments in the newspapers where it was hinted that the idea behind it all was to recognize the huge ethnic community in Canada and play more ethnic music. We may even see such instruments as pan-pipes, nakers, samisens etc. incorporated into our Western orchestras, who knows what the future will bring. There is certainly an increase in the number of Oriental, Middle Eastern and South Asian artists playing at concerts and on TV in Vancouver, B.C. and very good they are too. I was in China recently, and interestingly enough I noticed that Western music was burgeoning there. They had several symphony orchestras. Perhaps in my next life I shall be known as Bob the samisen not Bob the bass! I played the Ninth with Furtwängler twice. One in the late 1940’s with the London Philharmonic Orchestra at the Royal Albert Hall, London, and two with the Philharmonia Orchestra in the mid 1950’s at the Kunsthaus during the Lucerne International Festival, Switzerland. They were by far the best performances of the Ninth I’ve ever played. Furtwängler didn’t have much of a beat. He was lank, bald with a fringe of white hair, had a slight stoop and stuck his belly out when conducting. His approach was to transmit joy. It wasn’t a “Herrlich” performance as some conductors are wont to make of it, but impressed me with its musicality. Despite not having a very clear beat he could convey exactly what he wanted. It is hard to describe but it was uncanny. The first movement just flowed. There were no overly loud chords. The same with the second movement. The third was full of fun, not like the usual renderings with the tympani being allowed to play fortissimo like a ton of bricks being dropped. The last movement, beginning with the recitatives was just as Beethoven described his ideas to Sir George Smart during a meeting in September 1825. And I quote Sir George Smart “Beethoven gave the tempi of various sections of his symphonies etc, while he played them on the piano, including the Choral Symphony, which according to his reckoning took three quarters of an hour,which we know is impossible. In Vienna the recitative was played by four ‘celli and two basses which certainly is better than if one takes all the basses”. Schindler states that Beethoven required all the basses to play in a singing style, not stiffly but in strict time, not dragged. Thus it was with Furtwängler who segued into the Ode to Joy to make a glorious, joyful Finale. Link here to read a previous post on Furtwängler that you might care to peruse. Thank you to Jason Heath for sending me this interview with me which I am very pleased to put on my blog site. I really enjoy Jason’s blog, and as I tend to write about the past it’s nice to be brought up to date with present day bass happenings. He is doing a real service to the bass community. 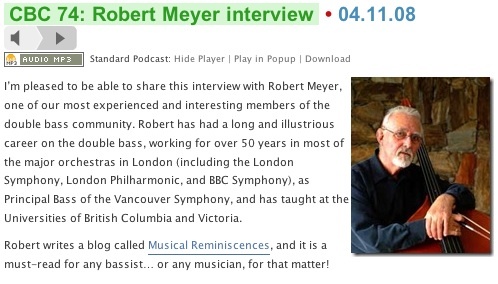 Listen to the podcast of the interview here, at his Contrabass Conversations podcast site. I well believe von Karajan when he said he joined the Nazi Party only to further his career. It could have been normal for any young man to have done so if he thought it would help him, however, so far I have not heard of any involvement he had in committing atrocities. After all these years I am willing to forgive him for being a Nazi, but not if he had been in the S.S. and committed any atrocities.. I was on the battlefield with the British Army and certainly have no time for the S.S. after many of my comrades were murdered by them. It was Walter Legge who discovered him in the late forties by listening to a record, so I’m told, and then built up his career. He paid back Legge and the Philharmonia in a rather bad way. It happened like this: The Philharmonia Orchestra was playing a concert in Baltimore at the end of a long, exhausting tour. There were demonstrations outside the concert hall about his Nazi past and as a result the hall was not packed as were all the other concerts we gave. At the morning seating rehearsal a violinist, Peter Gibbs, an ex-fighter pilot, stood and berated von Karajan for conducting the British and American National Anthems in what he thought was a casual way. Legge stood up and told him to sit down and afterwards assured von Karajan that Gibbs would not be allowed to play that night. However, Gibbs came to the concert dressed and ready to play, at which von Karajan refused to go on stage unless Gibbs was sent away. Dennis Brain, the principal horn and Gareth Morris the principal flute and a few others said they would refuse to play unless Gibbs played . After a long wait and some slow hand-clapping von Karajan came on after Gibbs had sat down in the orchestra. There was a second long wait after the interval. Next day, in Washington, we were to board the plane home to England but Legge, von Karajan and Mattoni, his agent, were not with us. A few days after we arrived home, the chairman of the orchestra members committee called a meeting and told us that he had received a letter from von Karajan’s lawyer in Vienna demanding an apology signed by every member of the orchestra. This was discussed, and as it was around Christmastide we sent him a card wishing him a happy Christmas. Shortly afterwards we received another letter stating that although von Karajan was under contract with EMI the name of the Orchestra was not mentioned in it so henceforth von Karajan would be making the recordings solely with the Berlin Philharmonic. He had already been approached by the Berlin Philharmonic to be their conductor so the row at Baltimore gave him an ideal excuse to leave the Philharmonia. Relentlessly, over many years the CBC budget has been gradually eroded, suffering the death of a thousand cuts. Probably there have been studies done already to find out what the heads of the CBC and the Canada Council are really doing for all the money that is expended on them. Enough of studies, just give them some more cash and resuscitate the CBC Radio Orchestra. There have been past studies that say that for every dollar expended on the Arts the return is ninefold. As the Orchestra is based in Vancouver, with the coming Winter Games in 2010, has anyone approached the Provincial Government for help? The Esterházy Princes were the patrons of so many great composers and musical events in the 17th and 18th centuries. Later came the 19th. century industrial barons who founded many orchestras throughout the world. When I was growing up in the Great Depression it wasn’t a good time for musicians. There were no subsidies, only donations from wealthy people and, on top of all that the talkies came in displacing hundreds of musicians from their livelihood. The London Symphony Orchestra, founded in 1904 was only playing the occasional concert. The BBC Symphony, founded in 1930, was the only permanent full time orchestra that paid its members a pension, and the London Philharmonic was founded in 1932 by Sir Thomas Beecham with the help I am told, of Lady Cunard of the shipping line. Opera was the same. The short seasons at Covent Garden were mainly élitist. Sadlers Wells opera hung on by a thread , but Lilian Bayliss,who was an indefatigable promoter of opera and theatre was on stage practically every night telling the audience that the whole endeavour was going to hell in a handcart if there were no more donations forthcoming, but somehow it survived. I remember going there as a kid and seeing and hearing much of the opera repertoire. Joan Cross was the prima donna whom I got to know later when I worked with Benjamin Britten in the English Opera Group. Another opera company that survived was the Carl Rosa with whom I played later on but because of some skullduggery going on between it and the British Council it was re-named Opera 1951 and went into oblivion. The British National Opera Company which did some good things was founded in 1922 but folded in 1929. The British Council was formed in 1935. When WWII broke out CEMA, The Council for the Encouragement of Music and the Arts was formed in Britain to entertain the masses, and another group, ENSA was devoted to more light entertainment,: Since that time music and the Arts flourished, so much so that every little hamlet seems to have had its own school of music and yearly festival, but now there is a decline in music; some orchestras are folding, people have less discretionary income and governments are spending money on other things deemed to be more pressing than music. Some might say there has been a surfeit of music. I heard one owner of a large record company say that in ten years there won’t be any more shops left selling CD’s. A big Canadian chain has cut down on its stores and no longer sells many classical CD’s; you have to order them specially. Maybe we musicians should take a look at where modern technology is taking us, with its ipods, blackberries, virtual orchestras and recorded music played for shows and ballets with no orchestra in the pit. It is not nearly the same, or as good, as live. I feel I have done more than my share in the past, putting on festivals, fund raising, building theatres and arts centres and forming a company to help young musicians, etc. etc. but perhaps some musicians and music lovers out there could and should make their voice heard and not let this fine Orchestra go into oblivion. It seems to me that it should be a part of a conductor’s mandate to use her/his power on the podium to encourage people to help the cause. Maybe also people behind the scenes in Radio and TV together with the paid mandarins in public arts organizations could get together and be a little bit more active in promotion of the Arts too. Save this Orchestra, it’s not yet too late, there could be a change of heart if sufficient people demand it. It wouldn’t be the first time it has happened. When I was a kid there was a music hall song called “Where do all the Flies go in the Wintertime?” One might just as well ask that of professional classical musicians. What do they do in their spare time? Well, it varies depending on the musician, if she/he is very busy , then it’s a humdrum life of just work and sleep. I can remember times when I would go for over three months without a day off. Eugene Cruft, my teacher and mentor once told me that I should do all my practice before entering the musical profession because once I started I would be too busy to do anything but play, eat and sleep. And so it turned out. All these oft quoted scenes of a Bohemian life are very rare. To earn sufficient money to live, many musicians have to teach. When I was freelancing in London there was no time to do that. I was fortunate to be very successful, but it came with a price. I bought a bigger house (with a bigger mortgage! ), I sent my kids to good schools but it all had to be paid for, so I had to keep my nose to the grindstone , (or my bow on the strings). But there were one or two who seemed to lead a more balanced life. Two bassists were good photographers, a ‘cellist in the BBC Symphony collected and repaired old clocks,. Two bassists in the London Philharmonic were skilled instrument repairers. Bob Norris, sub-principal bassist with the BBC Symphony made tolerably good basses, and Cyril McArthur, a freelance bassist who sometimes played in the Philharmonia Orchestra was fed up with the rat race so he went to a little village in Italy and made bass bows. I was told they were very good. Looking back, two profound statements were made to me that I didn’t realize at the time were so significant. One, Jack Upchurch was a tolerably good bassist, but his hobby was making model steam trains from scratch . One day I went to his house to see his model railway. I asked him why he didn’t do more playing, and he answered “You can either live to work, or work to live”. The second, which I mentioned in a previous blog came from Francis Baines, a bassist in the London Philharmonic who also was a good composer. He took leave from the LPO and went to live in a little cottage in the country for two years so that he could get down to serious composing. When he returned to the LPO I asked him if he had learnt anything in his absence, and he said “Yes, I have. You don’t need as much money to live on as you are led to believe”. The upshot of all this is that later on I studied painting, Tai Chi and cooking and it certainly has given me a more balanced life. I now go to concerts to listen from the other side of the footlights and occasionally scrape the bass, but, dear friends and colleagues, try not to be as insular as I was, take time to smell the flowers, it’s wonderful! When you take up the double bass you do it literally. To learn how to cart it around – it’s quite an art. Some basses weigh over twenty five pounds and I’m sure the exercise helps the cardio-vascular system. When I decided to free-lance after leaving the London Philharmonic in 1948, getting from one engagement to another became a daunting experience. You see, I had been used to putting the bass in its case and leaving it with the orchestral porters but now I was responsible for carting it around myself. There was not a great deal of traffic on the roads in London in those days because there was petrol (gas) rationing. The London Underground allowed you to take the bass on the “tubes” but it was physically daunting to take it up and down the moving staircases. For a small sum you could leave it overnight in a railway parcels office after giving a liberal tip to the attendant. Nowadays it is easier to get around with a bass as somebody re-invented the wheel, I mean designing a wheel that fits on the bottom of the instrument. As engagements became more frequent I realized that I really needed some form of motorized wheels, and I finally came across a new three wheeled van named “The Reliant” that had just come on the market. One of the advantages with this was that the license cost only five pounds, and, more important, it was classed as a trade vehicle, so I could be allowed unlimited petrol coupons. It was powered by an Austin Seven engine, but had one drawback that it was only capable of thirty miles an hour. Still, it made me mobile. I wouldn’t like to be free-lancing in London nowadays. From my home in Mill Hill it was about ten miles and I could drive to the Royal Festival Hall in Central London in half-an-hour, but nowadays one has to allow three hours to arrive there in time. Then there is the nightmare of parking and the the tax to pay before entering the city. I remember when I was playing at the Aldeburgh Festival I was driving down a country lane when I espied Benjamin Britten standing by his ancient Rolls Royce which had broken down. After stopping and seeing if I could help, Ben told me that a mechanic was on his way, so I just carried on sailing away in the Reliant, which always lived up to its name.